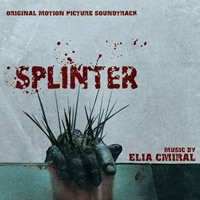 BUYSOUNDTRAX Records presents SPLINTER, featuring music composed by Elia Cmiral for the 2008 horror film directed by Toby Wilkins and starring Shea Whigham, Paulo Costanzo and Jill Wagner. SPLINTER is the first feature length film for director Toby Wilkins, from a script by Kai Barry, Ian Shorr and Wilkins. SPLINTER premiered at the recent ScreamFestLA and swept the awards ceremony, winning awards in six categories, including Best Editing, Best Makeup, Best Direction, Best Picture and, for Elia Cmiral’s efforts, Best Musical Score. SPLINTER tells the story of a convict and his girlfriend who carjack a couple on a weekend retreat in the woods. Both couples soon find themselves trapped together in an isolated gas station, on the run from a deadly parasite that occupies the woods outside. SPLINTER opens in theaters on October 31, 2008. Born in Czechoslovakia, Elia Cmiral quickly established himself as one of Europe’s leading young composers after graduating from the prestigious Prague Music Conservatory. He wrote scores for several European films and three ballets before coming to the United States to attend USC’s famous Film Scoring Program. Known for his work in thrillers such as APARTMENT ZERO and RONIN, Cmiral has begun to earn praise for his evocative and highly original scores in the horror genre, such as STIGMATA, BONES, THEY, WRONG TURN and, most recently, THE DEATHS OF IAN STONE, TOOTH & NAIL and PULSE 2: AFTERLIFE. Signed by composer Elia Cmiral.